Green Building Store’s essential guide to building your own Passivhaus. If you live in the Huddersfield/ West Yorkshire area you can contact our construction division Green Building Company, builders of the Denby Dale Passvhaus. We work closely with Huddersfield architect Derrie O’Sullivan and can offer design, build, training and consultancy services for your project. Green Building Company can offer Passivhaus consultancy services to projects outside West Yorkshire, please ring Camilla on 01484 461705 for more information. The Passivhaus Trust is an invaluable source of information and its members are the leading Passivhaus practitioners in the UK. 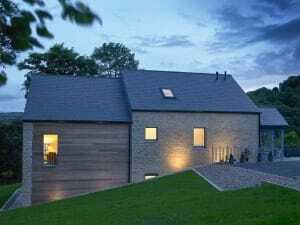 Your architect can help with this – low energy Passivhaus projects should be looked on favourably by planning departments – especially now that Passivhaus is becoming better known in the UK. To be a certified Passivhaus the project will have to modelled first in Passvihaus Planning Package software (PHPP). It is very hard to change a project into a Passivhaus after it has been designed. PHPP modelling has to go in tandem with architectural designs as it will allow the architect to see what is and isn’t possible within the parameters of Passivhaus methodology. Green Building Store now offers a PHPP design service. For more information, ring Camilla Govan on 01484 461705. Even if you decide not to go for Passivhaus standard with your project, we really recommend that you design the project using PHPP as it can help apply the Passivhaus methodology effectively and can accurately model how well your project is going to perform. As we have shown at Denby Dale, Passivhaus buildings can be built using many basic building materials found in any builders’ merchant. For the specialist Passivhaus elements such as windows, MVHR systems (mechanical ventilation with heat recovery ) and airtightness products, Green Building Store offers a specialist range of Passivhaus products.